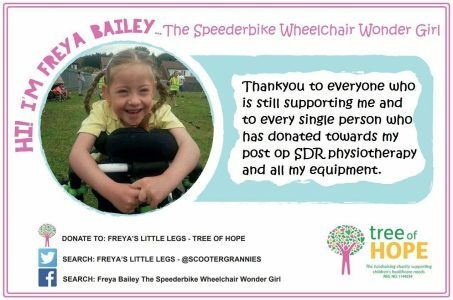 Freya the Speederbike Wheelchair Wonder Girl! Freya was born with cerebral palsy and two holes in her heart. 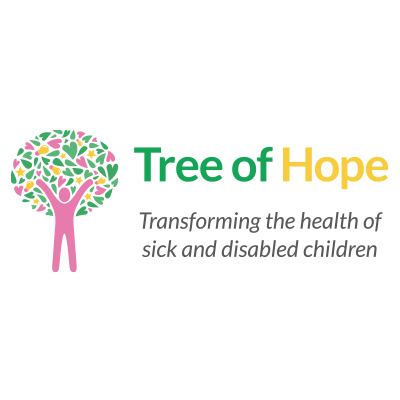 Her and her family joined Tree of Hope last year with the aim to raise £45,000 for post SDR (selective dorsal rhizotomy) surgery, equipment and therapy that will enable Freya to be more mobile, pain free and in time take her first steps. Freya’s Father Darren is now on a mission to raise the funds with lots of dedicated friends, family and their local community all involved. At almost half way to their target Darren is now taking on a challenge to raise more with fellow seven friends ‘The Scooter Grannies’ to help get to their total. “The scooter grannies will be riding on kids push along scooters from Irlam to Chester (approx 34 miles) shaking their buckets all the way. There are 7 of us that make up the Granificent 7, Myself, Stuart Jenkins, Lee Sleaford, Mike Phillips, Jamie McQuirk, John Wilson and Teddy Marshall. Plus 2 to 3 support drivers, Steve Seddon, Gary Rogerson and Louise Adele Davies” explained Darren. Among this, there are also other fundraising events happening for Freya, including a bucket collection at Salford Reds Rugby Ground on 7th April as Salford play Warrington! Freya is doing incredibly well after her SDR operation is developing more and more at every physio sessions. She is currently having 2 sessions of physiotherapy with a private physiotherapist. This will soon build up to 3 sessions per week to help her become stronger and more mobile. “She (Freya) is so brave and always smiling” Darren told us. Post-SDR Freya’s next chapter of her life has really only just begun. It is in the shape of a physiotherapy programme which will involve a lot of hard-work for Freya but with the help of her family, something Freya will succeed in, along with her cheeky smile. If you would like to support Freya you can read more of her story here!